-Edges, labyrinth in Martinez, Georgia, June 7th, 2007, all photos © 2007 by QuoinMonkey. All rights reserved. It was 96 degrees at 5pm. Mom and I did a quick geocache in Martinez, Georgia, right off of Columbia Road and Buckboard Drive. Geobrother, who has logged more than 1000 caches, gave us a few tips. I have barely learned to use a GPSr. Mostly I depend on Liz who easily navigates geocache land with stealth and grace. When we got to the cache site, Church of Our Savior stood in the middle of a drive around circle. Cars were parked on the grass, edging their front bumpers up to the hedge. We spotted a cool resting place next to the path and grabbed a pen, handwritten directions, GPSr, and Canon gear. 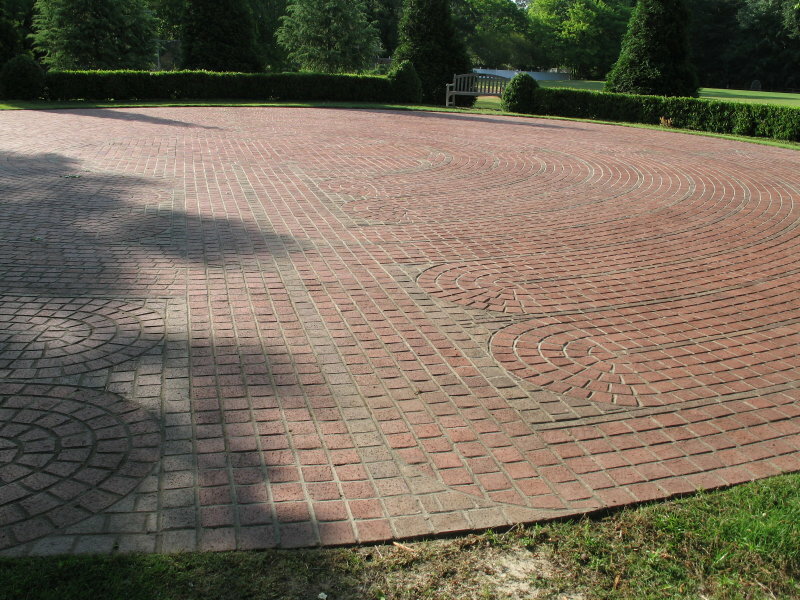 When we turned the corner past the hedge, there it was, a beautiful brick paved labyrinth. Mom knew it was there because she had been talking to my brother earlier. But I had not been clued in. I was gleefully surprised. I told Mom about walking the labyrinth at Carondelet as part of my practice during the writing Intensive last year. The pattern at Church of Our Savior drew a familiar map – a medieval replica of the labyrinth at Chartres Cathedral. I couldn’t have been happier. Mom immediately spotted the high resting cache, Inward Peace, from the edge of the labyrinth. Liz will be ecstatic. It’s our first cache in Georgia. Geobrother’s map of found caches goes all the way up and down the East Coast. Liz’s goes from East to West – Maryland all the way out to Wyoming. And now we can add Georgia. Hopefully tomorrow we’ll grab a cache in South Carolina before we leave for the far north on Saturday. For those who love labyrinths, there is a great tool out there called World-Wide Labyrinth Locator. You can type in a zip code, city, country, or state and up pops a list of addresses and descriptions of labyrinths in the area. Some have photographs and there are details of the architect and model, and whether the labyrinth is grass, brick, dirt, concrete, painted, mowed, or buffed. We didn’t have a chance to walk the whole labyrinth this afternoon. Though I did take a few photographs of Mom winding toward center. The brick red against summer green created high-contrast beauty. The surrounding inner path was lined in oleander. Only the evergreen leaves were present but I was taken by their shape and beauty. 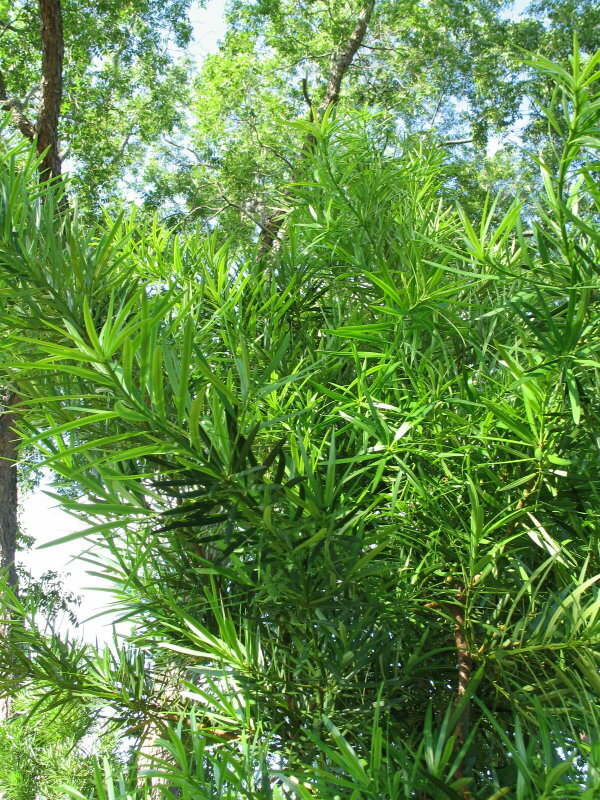 Oleanders are also poisonous and loaded with myth and history. My mother knows all the plants down here, most which bloom in stunning and fragrant color. I have spent much of the trip asking her detail names of plants and trees. Magnolias, miniature gardenias , crepe myrtle, mimosa, yucca, and lantana to attract the butterflies and bees, are only a few. We saw a brilliant lantana yesterday when we stopped to see a home that had been in my family. The same woman Mom met last year when she brought my youngest brother down was standing outside the house, tending her plants. “Remember me,” Mom laughed. And the woman said, “Yes, sure I do,” as she walked toward the car for a chat. She said she used to visit her own grandmother in the same house. I asked her if I could take a photograph and she graciously agreed. 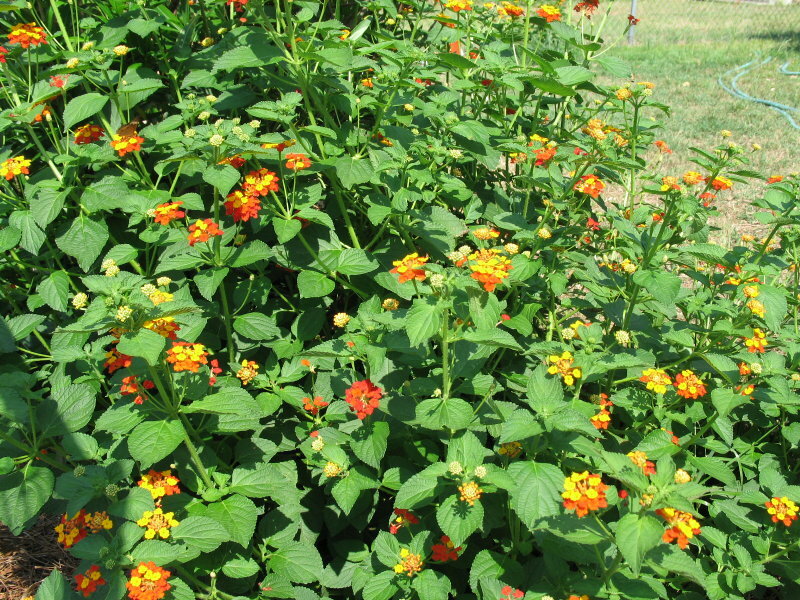 When I stepped behind the chain-link fence, the squat, bushy lantana was to the left, covered in dipping butterflies and darting, fat bees. And that’s when my step-dad and mom piped up about the nickname, Ham and Eggs. I kept being amazed at their knowledge of the plants, trees, shrubs, and flowers surrounding them. It reminded me of what Natalie said about knowing the trees in her neighborhood, about paying attention to the details of our environment. It’s important to know what surrounds us in earth, sky, and water. I felt glad my parents were in tune with the history of the land around them. And I knew they had passed that down to me. I felt joy at spending that kind of time with them. As an adult, I have come to appreciate the unpredictable and solid makings of a family. For the hundreds of times in my youth when I wanted to run the other way, there are only moments left to discover what I might have missed. –Brick by Brick, labyrinth in Martinez, Georgia, June 7th, 2007, photo © 2007 by QuoinMonkey. All rights reserved. I’ve never walked a red-brick labyrinth before. Beautiful. I have a small one on my writing desk that I “walk” with a stylus. I remember hearing one of your writes in zendo about walking that labyrinth. Gwen (from the zendo) and her partner constructed a labyrinth in the middle of the 3,000 off-the-grid acres they own in northeast New Mexico. I walked it last October. It was smack in the middle of the wild — in the center of the universe it seemed. The Washington Cathedral here in DC every so often lays out a very large cloth labyrinth that one can walk. Once, I watched an entire liturigal dance group “dance” the thing. Breathtaking. Now, this very minute, I want to walk one. Hearing the details of trees, plants, etc. reminded me that I recently hauled out a gardening book that I had forgotten about so I could learn the specific names for all things botanical because of what Natalie said. She’s right. “Beautiful purple flowers” just doesn’t cut it. Hope you’re getting some rest while those of us who read your words and look at your images “wake up”. In college I had to take a class that was about technology and culture and how the two influence one another. In that class, we had to write a huge paper about one specific technology and how it has / is / will effect society. Back then I had such a tough time coming up with something to write about. I remember, though, one of my classmates asked the teacher if he could write his paper on GPS. The answer was simply, no. GPS technology does not contribute to society at all. Being a tech geek, I was surprised to hear someone actually say it does not effect culture. I think he should read a bit about geocaching. If nothing else, it gets some of the population outside. Not on a couch in front of a TV. I’m glad Rob brought that up. I’m completely stupid about technology and have no idea what a “cacher” is. Can you provide a layperson’s definition? Thanks. Hey Rob- I would have to say your teacher is way wrong about GPS technology & culture. I would love to write a big paper on it, especially after I go to an all-day geocaching event in a few weeks. Cache on! Ah, geocaching, a subject close to my heart. A sport/hobby/passion where you uses billion dollar government satellites to find tupperware hidden in the woods. When quoinmonkey asked me for a few “easy” caches in the area I knew she had to do the one she posted. I was sure the labyrinth would invoke memories of her meditations and that would make this search more interesting. The GPS has changed our society in more ways than just geocaching. The trucking, shipping and air transportation industries are dependent on the GPS satellites. The government uses it to not only wage war but to keep track of assets, troops and strategic targets. If the GPS system failed we would have to revert back to paper maps, charts and astronomical navigation. Ok, I am off the soapbox. I was struck by the realization that in one generation we have lost touch with the natural environment that surrounds us. When quoinmonkey spoke of the knowledge her parents have of the plants in their area I realized how little I know about the plants in my yard let alone the surrounding woods. I remember my father-in-law knew every tree on his property and could tell me properties that made them unique. I knew my mother had a green thumb but did not realize how many plants she knew about. And growing up away from my father I am pleased to know he was as well versed about the plants in his town too. I had to know the local plants that caused rashes and to identify some of the more common trees for boy scouts and my kids dreaded “Leaf Project” but that is the height of my plant knowledge. I spend a lot of time in the woods looking for geocaches and now I think I will start to take the time to learn about the flora I come in contact with. Ok, I guess I had better stop now because my ignorance is starting to show. Ditto. My father knows the names of all the plants in his town, in his garden, that his mother loved. I do know he loves dahlias, that’s his favorite plant. But I, too, am learning names, and they’re hard to remember. Larkspur and foxglove look alike to me. Same with other nature. Birds, for example. R3 – very compassionate of you to send QM on a geocache that involved a labyrinth. I actually can’t find the right adjective. Kind, caring, knowing. Just a great thing to do given QM’s passion for and spiritual connection to labyrinths. I’ve only ever done one geocache. It was great fun. Combined my love for hiking, mountains, puzzles, curiosity all together. I could include the girls. Dee’s the one who found the cache after we concluded we were in the wrong spot. We weren’t. We just weren’t turning over rocks like she was. It’s kind of like blogging, too, the way it brings together communities of people from far-flung places who otherwise wouldn’t know one another. Sharonimo – a labyrinth in the middle of a 3,000-acre wilderness – wow. That would be quite special to walk. I wonder if it takes a lot of work to keep it from going back to wild, especially this year with all the rain in northern NM. Maybe I can put a labyrinth on our land somewhere. I’m going to think about this. What a lively discussion. Rob, I’m amazed that a professor would bother to state something close to that. As R3 stated, GPS technology has changed the Universe in so many ways. It was my brother who turned Liz and I on to geocaching. We fell in love with it right away. The great thing is that it gets us out of the house and into nature where we can keep trying to identify flowers, trees, birds, and mammals! We both love it and I think our favorite way is to take a motorcycle ride out to some more remote caches, park, and take off on foot. Liz’s first cache was in Ocean City, Maryland with Mom on the boardwalk. It was fun. We also did a Webcam cache there with Geobrother looking on from his computer. He took a photo from the webcam, then we logged it. ybonesy mentioned community and she hit the nail on the head. Liz and I have been to a couple of larger cache events. And Geobrother has been to tons of them. He’s met a lot of great people geocaching! R3, I love your idea of starting to identify plants and trees on your future caches. It would be cool to add them to your geocache logs. Maybe we’ll try to do that, too! skywire, glad you are sticking up for geocaching. 8) R3, talk about letting ignorance show, I am ashamed to admit I haven’t yet learned to use Liz’s GPSr. I’ve dabbled with it but find the intuitive hunting and sleuthing comes more naturally to me. I need to sit down and learn how to use the GPSr! I’m adding it to my list of things to accomplish this summer! Sharonimo, I think you hit on something when you said you walk the labyrinth with your stylus. 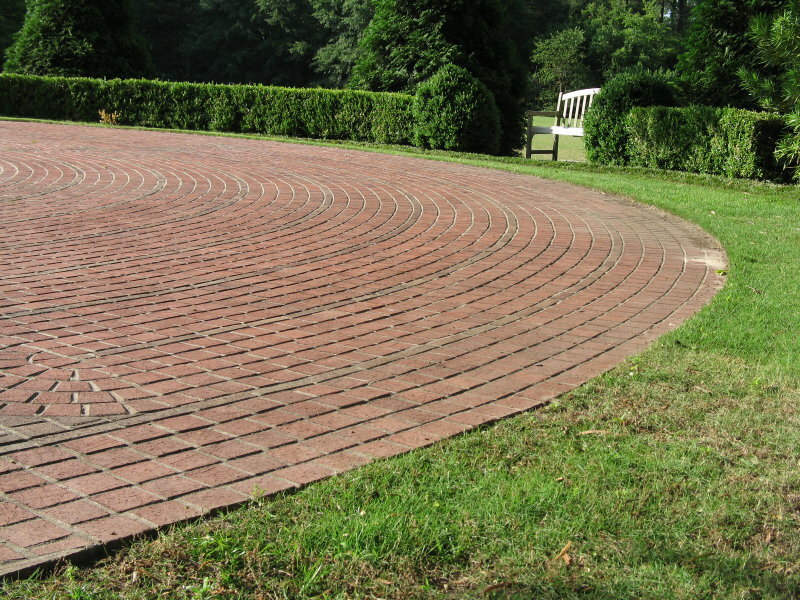 The labyrinth is a universal symbol and archetype of peace and meditation. And there are many versions of it in circulation. I found yesterday that as soon as I saw the red brick map of winding turns with the lotus at center, I was immediately calmed. I felt a great sense of peace. Maybe from the times I walked Carondelet last year. But I think it more has to do with every person who has ever walked one before. They are all there walking with me, people from all over the world. It’s a comforting feeling. ybonesy, great idea to put one on your land. Let me know when you might think about doing it and I’ll come out and help you build it! The one at Carondelet is all grass and has to be tended and mowed by the groundskeeper. I bet the practice of keeping it up is also meditative. And, yes, I have such a thoughtful brother. Geobrother led me right to the best cache in the whole area – the most perfect one for me. I appreciate every day the way my family supports me like that. Mom’s been a trooper on this trip. She’s really helped me immensely with the research on my memoir. I don’t think I could do it without her. Great photos and story of the brick labyrinth! I am making a non-commercial slide show on labyrinths. -Brick by Brick, labyrinth in Martinez, Georgia, June 7th, 2007, photo © 2007 by QuoinMonkey. All rights reserved. Hi Gary, thank you for your request for the photograph. And for drawing up this post again. 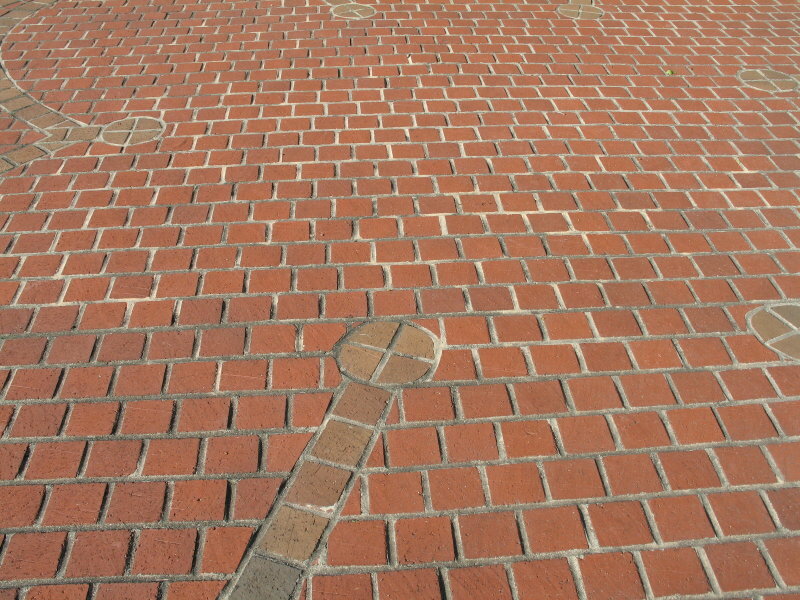 I hope to be visiting this brick labyrinth again in July when I head back down that way. And thanks for asking permission to use the image. I will check out your site over the next few days and get back to you via your contact info there. Thanks again. So glad to hear from other labyrinth lovers out there!